Warren Harding was the 29th President of the United States who served in office from March 4, 1921 to August 2, 1923. What was the life of Warren Harding like? The short biography of President Warren Harding covers important information and facts about his early life, his family, career and the famous events and achievements of his political life. 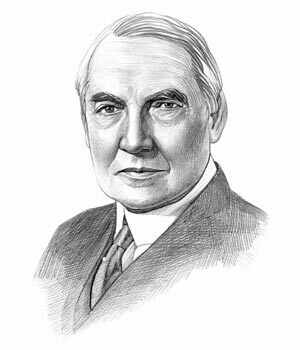 Our short biography of Warren Harding provides an interesting and easy way to learn about the life of the President. The following important facts provide a fast overview of important facts about President Warren Harding. Facts and Info: Warren Harding was the 29th president of America. He was dogged by various scandals during his presidency and died in office, just as massive corruption in the Teapot Dome scandal was about to become public. For additional info refer to 20 Facts about Warren Harding. Facts and Info: Warren Harding was born on November 2, 1865 in Blooming Grove, Ohio. Warren Gamaliel Harding was named after his great-uncle the Reverend Warren Gamaliel Bancroft who was a Methodist chaplain at the Wisconsin State Prison. Warren’s mother had wanted to name him Winfield but deferred to her husband’s wishes but she called him “Winnie” all her life. Facts and Info: The career of Warren Harding included the roles of Editor-Publisher, Politician and Statesman. He became the 29th President of America in 1921 and served for 2 years until his untimely death in 1923. Warren Harding died on August 2, 1923 during his Presidency whilst visiting San Francisco, California. Facts and Info: Warren Harding married Florence Kling who was called Flossie. Flossie had a son called Marshall Eugene DeWolfe who idolised his stepfather. The couple had no children of their own and their marriage was an unhappy one. Warren Harding was a weak, inept president and many of his advisors were dishonest and later charged with defrauding the government. He was implicated in the Teapot Dome Bribery Scandal involving a former United States Navy oil reserve in Wyoming that was secretly leased to a private oil company in 1921. He died before the scandal was made public. He is known to have had affairs with at least two women. Their names were Carrie Phillips and Nan Britton. There were even rumors that his wife, Flossie, had poisoned the President to save him from being engulfed in charges of corruption. Facts and Info: Warren Harding belonged to the Republican Political Party. He was 55 years old when he was inaugurated as the 29th president. Inauguration is a President's swearing-in ceremony. Calvin Coolidge stood as the Vice President. Warren Harding was dogged by various scandals during his presidency. For additional facts refer to his Presidential Cabinet members. Short Biography of Warren Harding: What he was like! Facts and Info: Warren Harding was large-boned, 6 feet tall and had thick white hair, bushy black eyebrows and grey eyes. He dressed impeccably. Warren Harding was the first candidate to hire a speechwriter. He hosted weekly poker games at the White House and once lost all of the White House china gambling. Facts and Info: During his presidency he officially opposed entry into the League of Nations and war protestor Eugene V. Debs was pardoned. World War I was formally ended by joint resolution and in 1922 the US, France, Great Britain, Japan & Italy signed an agreement to limit naval armaments. Facts and Info: During his life Warren Harding experienced a nervous breakdown and spent several weeks in a sanitarium in Battle Creek, Michigan, run by Dr. J.P. Kellogg of the breakfast-cereal Kelloggs. He also suffered from various illnesses including hypertension, diabetes, heart disease and pneumonia. Facts and Info: Warren Harding died of apoplexy, a rupture of the brain artery and a stroke. He died on August 2, 1923 in San Francisco and was buried in the Harding Memorial, Marion, Ohio. The short biography of Warren Harding provides a fast overview of the key facts and events about his life and the accomplishments of his presidential term in office. The following Warren Harding video enables you to sit back and listen to the history of his personal and political life - a useful educational resource for kids, children and schools learning about the life of President Warren Harding.